Paper size: 21.5 x 29.5 cm. Number #11 from the series Kaiju Manga ( Pictures of Magical Animals), self-printed in an edition of 45 in November 2017. The hidden allusions, interpretations and suggestions of this print are bolstered by the fact that this is (probably) the very first black-light woodblock print in history! See detail 1 for the print when exposed to blacklight in the dark, and detail 2 for the print plus transfer. Artist's comment: "A decapitated pyramid stands in a divided desert; Latin flagging the New World Order, above floats the all-seeing eye. The Great Seal of the United States is an amalgam of occult symbols. Inside the gold mine, beneath the walls and watchtowers, ringmaster Trump runs a circus. 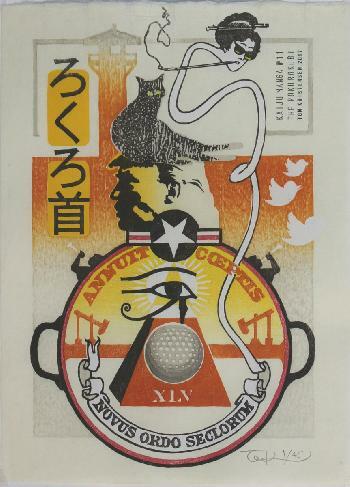 A bill of trumpets, tweets and golden tablets; a balancing act on the greatest golf ball. Ever. Also in the freak show are Saito�s black familiar cat and the rubber-necked head of Hokusai�s rokurokubi."